25 screw on footholds that are perfect to improve your foot work and technique. 20 screw on footholds. Specially designed for competitions. 14 holds in this set. Small crimps and pinches, ideal for many angles of wall. 15 holds in this set. Size (5) XTRA SMALL, (5) SMALL and (5) MEDIUM.Granite texture has never been quite so real. 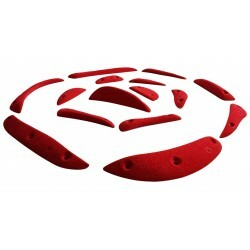 This superb set of shapes will offer everything yourequire for setting high quality technical boulder problems and routes. 9 holds in this set. Size Medium. Sloper style shapes with subtle crimping that work very well forcompression type moves. 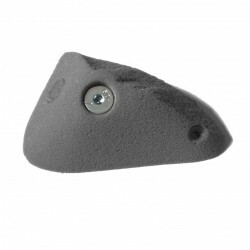 Perfect for fixing to Volumes and Arêtes, as well as traditionally to yourclimbing wall. 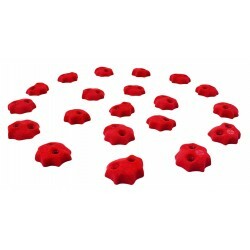 100 screw on footholds, perfect to improve your footwork and technique. 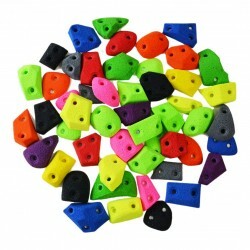 10 holds in size S-XS, VERY POSITIVE crimps for 15-45º walls. 10 Screw on holds with Sandstone texture. 15 Screw on holds. Extreme crimps and mini rails. 18 holds in this set. Size S-XXS. 13 footholds and 5 technical crimps. Great shapes for allwall angles depending on grade, difficulty, etc. 14 holds in this set. Size Medium. 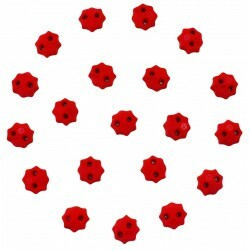 These shapes are very difficult to hold, but have a multitude ofuses. Perfect for slabs and competition use, these shapes are also good for hands and feet whenfixed to arêtes and volumes. 14 holds in this set. Size Small to Medium Small. These Geometric shapes could be used as technicalfoot or hand holds on plywood volumes, slabs and arêtes. Nice set of small balls, similar but all different, perfect for using as footholds. 20 XS holds, irregular crimps or footholds, M10 Allen bolt + anti-spin screw on. 27 useful holds to adjust your boulder dfficulty. 17 shapes in this set. Size Extra Small.Known as the Water Drops, these screw-on foot holds have huge potential. Exquisitely designed andcarved by Ferran Guerrero for Alamo climbing, they are sure to be popular. 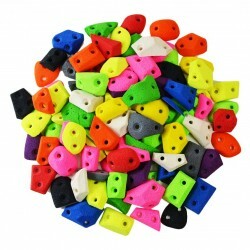 Water Drops will be useful on all routes and boulder problems across many angles of climbing wall. 50 screw on footholds, perfect to improve your footwork and technique. 25 holds in this set. XXS in size. Discover the CHICKPEAS, very small and exceptionally hard to hold, these new shapes make great foot holds too. Screw-on for endless setting potential and with very swish DUALTEX that allows youonly one way to use them... Are they very small pinches or exquisite foot holds ? You decide. 20 holds in this set.Another set of identical holds with Star shape. Designed for use as technical feet or small crimps, with different height all around, you can adjust the difficulty by rotating the hold and searching for the exact difficulty and then fix it in place. A great tool for all route setters. 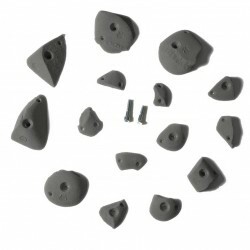 20 holds in this set.Identical rounded holds that were designed for use as technical feet or very small crimps. With different height all around, you can adjust the difficult by rotating the hold and searching for the exact sweet spot before you fix it in place. A great tool for all route setters. Feel the granite beneath your fingers and enjoy the realistic details in this set of20, Extra Small holds. Use for feet or hands on super crimpy problems. Realistic shapes never go out of style and these prove that. The Smallest version of the crashed UFO's family. 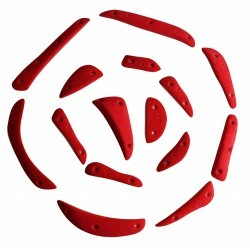 These are small in-cuts, verypositive, perfect for crimpy steep boulder problems or routes, at home on all angles of wall and styles of setting.